SSC CGL 2015 Tier II result: Staff Selection Commission has announced SSC CGL 2015 Tier II result on 09-02-2016 at ssc.nic.in. Here we are providing you Official Result PDF Files along with candidates marks. SSC had conducted SSC CGL 2015 Tier II exam on 25th & 26th October, 2015. A large number of candidates appeared for this exam. Actually the official answer was released on 27th Jan 2015. 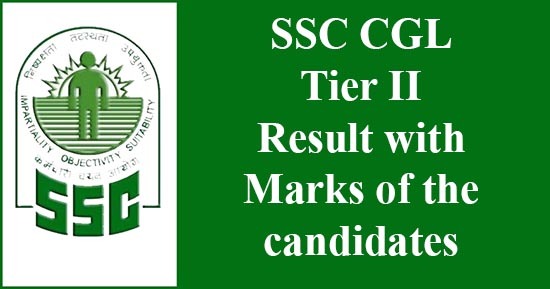 Now, today finally declared much awaited SSC CGL 2015 Tier II results. Today, SSC has released the cutoffs and names of shortlisted candidates for Interview & non Interview posts. SSC has also released a list of shortlisted candidates for the Statistical Investigator positions. (* In addition to the number of UR candidates shown above, 798 OBC, 36 SC and 10 ST candidates are also meeting the cut-off for UR category. Such candidates have been shown in their respective category). * No vacancy reported for ST category. (* In addition to the number of UR candidates shown above, 2354 OBC, 126 SC and 31 ST candidates are also meeting the cut-off for UR category. Such candidates have been shown in their respective category). a) Due date for Mark sheets of all candidates : In their official notification, SSC has declared that mark sheets of the candidates who appeared for SSC CGL 2015 Tier II will be uploaded on official site on 12th February, 2016 by 12 PM. b) Status of Interviews for SSC CGL 2015 & 2016 : SSC has confirmed that as per the directions given by our Prime Minister Narendra Modi, SSC has dispensed with interviews for the All India Competitive Open Examinations conducted by SSC w..r..f. by 1st January, 2016.
c) But considering the promised structure of SSC CGL 2015 Exam in their previously released exam notification, SSC will conduct interviews of the shortlisted candidates for Interview posts. f) Final result : SSC will declare the final result of SSC CGL 2015 exam by the third week of April, 2016. The Staff Selection Commission conducted the Combined Graduate Level (Tier-II) Examination, 2015 on 25 & 26.10.2015. The result is available on SSC’s Website: http://ssc.nic.in. Marks of the candidates will be placed on the website shortly.